Introduction to Stochastic Differential Equations with Applications to Modelling in Biology and Finance offers a comprehensive examination to the most important issues of stochastic differential equations and their applications. The author — a noted expert in the field — includes myriad illustrative examples in modelling dynamical phenomena subject to randomness, mainly in biology, bioeconomics and finance, that clearly demonstrate the usefulness of stochastic differential equations in these and many other areas of science and technology. 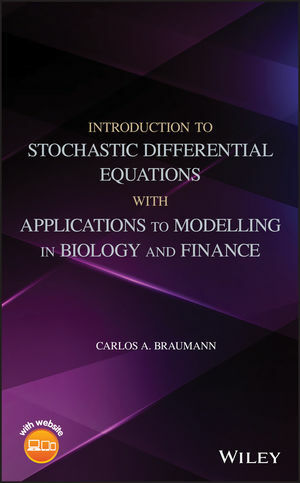 Written for use by graduate students, from the areas of application or from mathematics and statistics, as well as academics and professionals wishing to study or to apply these models, Introduction to Stochastic Differential Equations with Applications to Modelling in Biology and Finance is the authoritative guide to understanding the issues of stochastic differential equations and their application. CARLOS A. BRAUMANN is Professor in the Department of Mathematics and member of the Research Centre in Mathematics and Applications, Universidade de Évora, Portugal. He is an elected member of the International Statistical Institute (since 1992), a former President of the European Society for Mathematical and Theoretical Biology (2009-12) and of the Portuguese Statistical Society (2006-09 and 2009-12), and a former member of the European Regional Committee of the Bernoulli Society (2008-12). He has dealt with stochastic differential equation (SDE) models and applications (mainly biological).